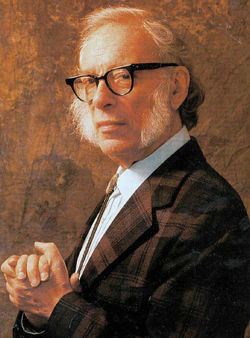 Isaac Asimov (Russian: Исаак Юдович Озимов - Isaak Yudovich Ozimov), (Petrovichi, ca. Born::January 2, 1920 — New York, Died::April 6, 1992) was a staunch, anti-creationist, scientist, science fiction author, and atheist known for his irrational skepticism towards creationist beliefs. Asimov only accepted facts that suited him, preferring to remain deliberately ignorant of God. Asimov on Physics. Garden City, NY: Doubleday, 1976. Understanding Physics. New York, NY: Walker, 1966. This page was last modified on 11 April 2013, at 07:29.